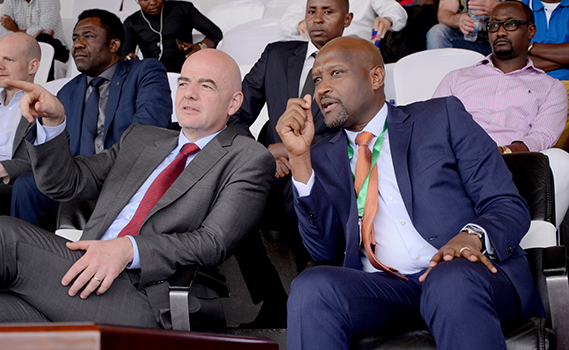 The FIFA President Gianni Infantino who is in Rwanda witnessed Police FC and Rayon Sports struggle to impress the global soccer boss ending up in a dramatic draw. 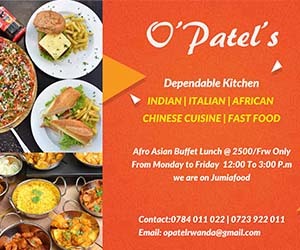 Gianni Infantino is in Rwanda for a two-days visit mainly to lay the foundation stone for the FERWAFA hotel to be built in Kigali. The 4-star hotel construction located in Remera, Kigali will be 65% sponsored by FIFA in its programme to develop infrastructure to elevate football and business-centred football. The 46-year-old Swiss turned up at the Kigali International Airport from Uganda in the afternoon and went straight to the Amahoro National Stadium to watch a dramatic Azam Rwanda Premier League game between Police FC and Rayon Sports FC. Police dominated the first half, firing into Rayon Sports’ nets relentlessly. Burundian midfielder Pierro Kwizera scored the opening goal for the Blues against the Rwandan Police-sponsored side. Having had been beaten by Rayon Sports in the first league match, Police who had come with a revenge intent, put pressure on Rayon Sports and scored their equalizing goal through the now league top scorer Danny Usengimana who hit a header in the goal from a cross by right back Mohammed Mpozembizi. Assisted by Danny Usengimana, Justin Mico scored for Police FC in the minutes to lead the half time score. International left back Abouba Sibomana who returned back to Rayon Sports from Kenya’s Gor Mahia could not make it to the final whistle as he was seen lying down in the field due to a presumed thigh injury. Right after Sibomana was taken off the field, through a corner kick, Rayon Sports scored the goal in the second half which was denied by the referee as a hand goal. Rayon Sports got their equaliser in the 83rd minute due to a mistake by Police FC goalie Emmanuel Bwanakweli who scored the own goal in favour of Rayon Sports. Rayon Sports pushed for the 3rd goal and got three corner kicks and two free kicks which they could not convert into scores ending the game in a 2-2 draw. Meanwhile, Rayon played without their two Malian strikers Moussa Camara and new Tidiane Kone who refused to play apparently due to a payment strife with the team management.